Click screenshot to see larger view. 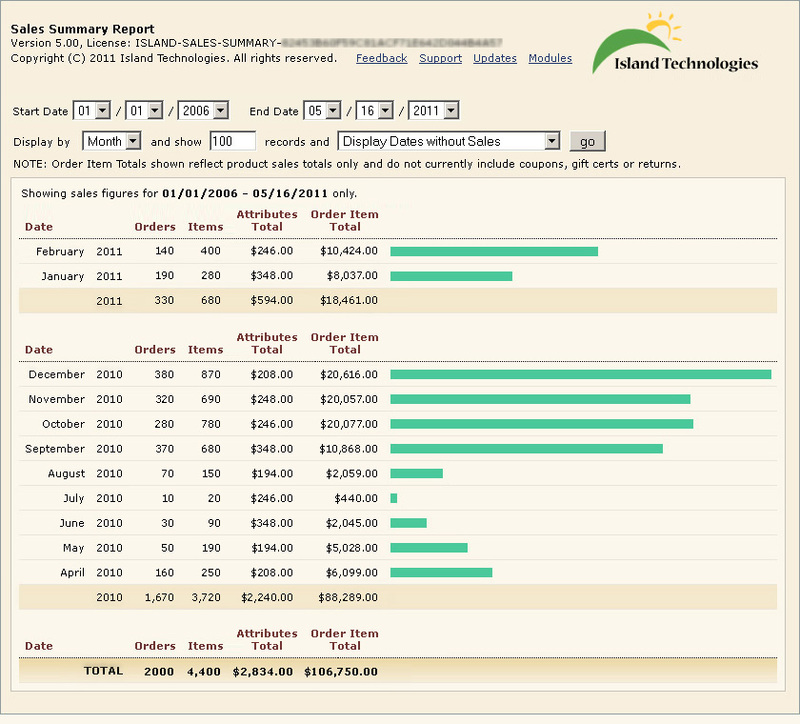 With the 'Sales History' report, see your sales by Year, Month, Week, Day and Hour. You choose how much reporting history to see. The answers to these questions will help you further refine your merchandising and marketing strategies -- and will help surface historical sales trends. Now showing Order Attribute totals & Date Range search! What are the annual sales trends for your store? See how many orders were placed each year. See how many items were sold each year. Determine if average order size is increasing or decreasing over time. Which month generates the most orders or items sold? Are December sales up or down over the last several years? What are attribute totals for any given timeframe? What was the ordering volume this time last year? Weekly patterns are often overlooked in business analysis, but by digging deeper into the monthly data, weekly views help explain which week is responsible for a great sales month! What are the sales patterns preceeding major holidays - are they the same year to year? Knowing how soon your customers begin their Valentine's Day or Christmas shopping can help you make sure you have adequate inventory in the weeks preceeding a major holiday. What was your biggest sales day this year (or last year)? Knowing the answer to this question can help you repeat previous successes. A short-term snapshot for the basic everyday question - are sales up or down today? What is the ordering volume right now? Most useful to gauge current-events customer purchasing reactions to recent marketing or press activity. What time of day do your customers shop the most? Use this info to plan the best time for site updates, or to decide which day of the week is best to send out your email marketing campaigns. Easy to install yourself - no custom installation required. Data is formatted to allow easy copy/paste into Excel for additional analysis. NOTE: This report does not currently include coupon or returns data.